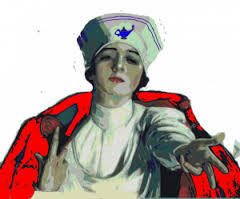 Nurses Have Higher Than Normal Cancer Rates. It May Be Stress or Night Work. One Hospital Is Dealing With The Problem Head On. Nurses are typically willing and accessible participants in health studies, and so a lot is known about them. They have about the same mortality as the general population, but two things stand out: They have almost twice the rate of cancer, but about half the rate of heart disease. The exact reason for this rather profound difference is not really known, but we could speculate. Nursing, by its very nature, is stressful. Nurses are continually dealing with medical situations, frequently serious and sometimes life threatening. Nursing also involves shift work which disrupts circadian rhythms, and this could also be a cause. Other professions involving shift work also have higher cancer rates. One might also wonder why the nurses are so heart healthy. Perhaps it is the physical attribute of it—hoisting patients around, and so on. Maybe this is a bit like ‘gathering’, or maybe nurses are more aware of healthy heart practices, or get better medical care. One would hope so. Researchers at The Ohio State University Wexner Medical Center conducted a study that found that the stress levels of employees exposed to a highly stressful occupational environment were reduced when there was a mindfulness-based intervention. During the study, members of a surgical intensive care unit were randomized to a stress-reduction intervention or a control group. The 8-week intervention included gentle stretching, mindfulness, meditation, yoga and music, all conducted in the workplace. 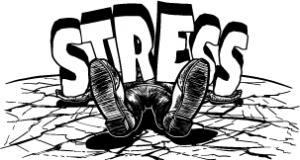 Biological and psychological stress markers were measured both one week before and one week after the intervention in order to see if the coping strategies would aid in reducing stress and burnout among the participants. In general, stress is broken down into two types: short term and chronic. Now, if the cause of the short term stress doesn’t harm a person, then it can actually be a good thing for the body. Chronic psychological stress is an entirely different story. What we do know is that while the body doesn’t seem to be evolved enough to deal with chronic stress, civilization does seem to be evolved enough to deliver it in epic proportions. Both types of stress will throw the hypothalamus out of homeostasis, but only chronic stress keeps it there. The adrenal glands manufacture cortisol and adrenaline, both hormones associated with stress. The hypothalamus controls this, and it decides to pull the trigger on these hormones based on input from the neo-cortex, the amygdala and the hippocampus. Since the amygdala makes emotional decisions, and the hippocampus deals with the memory of traumatic events, it’s easy to see how a variety of things might initiate a stress response. Is chronic stress something you should worry about? Well, we know that chronic stress carries with it a chronically high level of cortisol, also known as a fight or flight hormone. Because it prepares the body for fighting or fleeing by increasing available energy, blood glucose, it will shut down functions that aren’t immediately needed. Cell renewal and repair are such functions. Not only does cortisol prepare the immune system to deal with possible wounds, it also makes inflammation more likely. The most dangerous part of chronic stress is that the high cortisol levels will shut down the rest of the immune system. Along with cortisol, multiple other hormones are also raised in preparation for what the body thinks is a life or death situation. Our bodies simply cannot sustain this intensity without physiological damage. Because most situations today aren’t life threatening, our body’s interpretation is inappropriate. The lowered immune system means that cancer is the most prominent problem associated with chronic stress. In order to thwart off cancer, you need to get your cortisol down to a reasonable level, and anti-anxiety medication simply won’t do the trick. Our message to patients is a simple one: Patients: be patient with your nurses, help them lessen their chances of getting cancer. Nurses, it’s not too late to find some stress relieving activities. Be just as kind to your own bodies as you are to the patients you help on a daily basis.